Finzi is a composer whose music clawed its way to familiarity. His works now boast a passionate and numerous following. His works have been multiply recorded, initially by Lyrita in vinyl's salad days. They have been recorded again and again and a new harvest of them seems to have re-appeared in each decade since the 1970s. The Cello Concerto is an example. In the late 1970s it was Lyrita and Yo-Yo Ma with a belated appearance on CD in the 2000s. Then came Raphael Wallfisch on Chandos making hay during the long years when Lyrita's legacy seemed locked away on 'obsolete' LPs. Chandos packaged and re-packaged with the work on four discs: CHAN8471, CHAN9949, CHAN10425 and most attractively with the concertos by Bax. Bliss and Moeran on CHAN241-56. After Chandos and Wallfisch came Tim Hugh on Naxos and now Chandos have this completely new recording as the centre-piece of this CD. 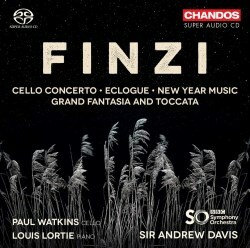 Paul Watkins' and Sir Andrew Davis's recording of the Finzi Cello Concerto proves that deeply moving does not necessarily equate with slow. The tempo is pressed and an unaccustomed emotional heat is radiated. Unmistakably you feel both aspects (speed and passion) and I am not at all sure I have yet adjusted to this. This recording of the Concerto is faster than Yo-Yo Ma's by some four minutes and at the time of Ma’s recording we are talking about a largely unknown soloist and a pretty much unknown work. It's sobering to think that the young cellist would have learnt the piece from scratch in 1978/9. My discomfort aside, this concerto was from the very end of Finzi's life when his music was beginning to accommodate a darker world so this approach by Watkins and Davis may well be apposite. As a work, Eclogue is placid innocence personified but neither Lortie nor Davis hang around. The work quickly develops a fast pulse. It's slower in other hands: Naxos 10:51 Peter Donohoe; Lyrita 10:33 Peter Katin; and Decca 10:42 Piers Lane. This reading of Nocturne also has about it an air of urgency as if the new year had Finzi looking in a Hardy-like way backward over the year that had irretrievably gone and forward to a year that day by day would inevitably slip through the fingers. This works well as an alternative approach. The bipartite Grand Fantasia and Toccata is an unqualified success with grandeur and a last lickety-split Toccata that skips toe-tappingly along. Its jazzy quicksilver recalls Walton's much earlier and equally brilliant Sinfonia Concertante. Chandos's technical team of Brian Pidgeon, Jonathan Cooper and Rosanna Fish match Davis's heated expressive qualities with a very warm image that fills the audio spectrum. The excellent notes are by Andrew Burn, a long established and accessible eminent voice among Finzi scholars. All in all, this will speak to Finzians who are impatient with the received wisdom of the slow 'green' pulse and who want something with a more passionate rasp and with blood coursing though its veins.